Q: What is the Imagine a World fair? A: The Imagine a World Fair is an interactive science and art fair geared to Redding Elementary School students and families but is open to the public. It will be on Saturday, January 26 from 1:00-3:00 at Redding Elementary School. Q: How long has this fair been an event? A: The Imagine a World Fair has been an event for three years. It began in 2016 and was headed up by a current Redding Elementary School parent, Nancy Shalala. Q: Who participates in the fair? Who are the creators and who attends? A: The fair is open to anyone who lives in Redding and the surrounding towns. It is a free event for all members of the family! Parents and Joel Barlow High School Science Club members create and run the tables and stations. There will also be student exhibitors who have created STEM (Science, Technology, Engineering, Mathematics) projects. The Heritage Center has also been asked to participate. Q: What is this year’s theme and how was it chosen? A: This year’s theme is The Elements. The elements are fire, water, wind, and earth. Parent volunteers through the PTA wanted to have a theme that could provide a variety of stations. Last year the fair was centered around the theme of the 5 senses and the elements promise to provide an exploration into properties of matter and environmental studies such as recycling and conservation. Q: What can guests do if they come to the fair? A: The fair is interactive. There will be a candle-making station and a seed planting station. Guests will be contributing to a large mural made out of scrap paper. There will be a station all about why water and oil don’t mix. There will be lots and lots of fun activities and presentations of information related to fire, wind, water, and ice! Q: What do you want the public to know about the fair? A: I want people to see what a community we have here in Redding and Redding Elementary School. 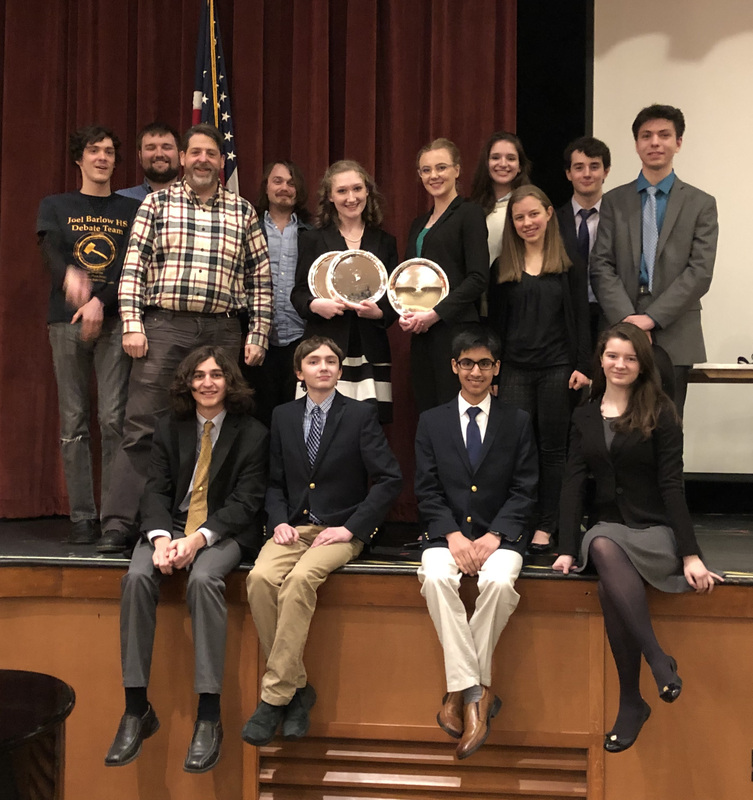 This past Saturday at the Fairfield-Warde regional debate, Joel Barlow senior co-captain Madalyn Migliorino was the first-place varsity speaker. She and her partner, senior Charlotte Bridwell were the second-place varsity team. The topic was whether or not third parties should be allowed to invest in civil litigation. Following a highly competitive round of grant applications, the Norwalk River Valley Trail (NRVT) has been awarded $300,000 to construct the Redding Mile. Construction of this section of the 5-town trail will be the first section in Redding. The grant, awarded from the Recreational Trails Grant program and administered by the CT Department of Energy and Environmental Protection (CT DEEP), marks the third grant awarded to the NRVT. “It’s very exciting to see the Norwalk River Valley Trail coming to Redding” stated First Selectwoman Julia Pemberton, “Iapplaud the hard work of the trail’s steering committee and our Redding residents.” A shovel-ready trail design, community support, and successful fundraising, supported a high ranking of the application, which led to the award. The NRVT was one of 74 applicants competing for a portion of the $3,000,000 available. In the end, 20 projects were selected to receive grants. The $300,000 is only a portion of the $390,000 projected cost for the Redding Mile. As a matching grant program, the RTG requires the recipient to raise the balance. To date, $58,000 has been raised, leaving a $32,000 gap. Sections already built in Wilton and Norwalk have been touted as leading community assets, with a trail census in Wilton documenting up to six thousand users a month. The Redding Mile, located in the rolling woodlands between Pickett’s Ridge Road and Fire Hill Road, will be constructed in 2019. Ridgefield is hopeful to share in similar success and build an adjoining 1.5-mile section to the south in 2020. Tax deductible donations to close the gap can be made through the trail’s website, NRVT-Trail.com. Questions can be directed to Executive Director, Charlie Taney at ctaney@NRVT-trail.com.